Will Durant [American historian] - "India was the motherland of our race, and Sanskrit the mother of Europe's languages: she was the mother of our philosophy; mother, through the Arabs, of much of our mathematics; mother, through the Buddha, of the ideals embodied in Christianity; mother, through the village community, of self-government and democracy. Mother India is in many ways the mother of us all". Mark Twain [American author] - "India is, the cradle of the human race, the birthplace of human speech, the mother of history, the grandmother of legend, and the great grand mother of tradition. our most valuable and most instructive materials in the history of man are treasured up in India only." Albert Einstein [American scientist] - "We owe a lot to the Indians, who taught us how to count, without which no worthwhile scientific discovery could have been made." Max Mueller [German scholar] - If I were asked under what sky the human mind has most fully developed some of its choicest gifts, has most deeply pondered on the greatest problems of life, and has found solutions, I should point to India. Romain Rolland [French scholar] - "If there is one place on the face of earth where all the dreams of living men have found a home from the very earliest days when man began the dream of existence, it is India." Hu Shih [former Ambassador of China to USA] - "India conquered and dominated China culturally for 20 centuries without ever having to send a single soldier across her border." Mark Twain - "So far as I am able to judge, nothing has been left undone, either by man or nature, to make India the most extraordinary country that the sun visits on his rounds. Nothing seems to have been forgotten, nothing overlooked." Keith Bellows [VP - National Geographic Society] - "There are some parts of the world that, once visited, get into your heart and won't go. For me, India is such a place. When I first visited, I was stunned by the richness of the land, by its lush beauty and exotic architecture, by its ability to overload the senses with the pure, concentrated intensity of its colors, smells, tastes, and sounds... I had been seeing the world in black & white and, when brought face-to-face with India, experienced everything re-rendered in brilliant technicolor." Mark Twain - "India has two million gods, and worships them all. In religion all other countries are paupers; India is the only millionaire." 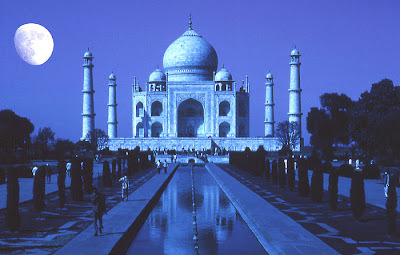 A Rough Guide to India - "It is impossible not to be astonished by India. Nowhere on Earth does humanity present itself in such a dizzying, creative burst of cultures and religions, races and tongues. Enriched by successive waves of migration and marauders from distant lands, every one of them left an indelible imprint which was absorbed into the Indian way of life. Every aspect of the country presents itself on a massive, exaggerated scale, worthy in comparison only to the superlative mountains that overshadow it. It is this variety which provides a breathtaking ensemble for experiences that is uniquely Indian. Perhaps the only thing more difficult than to be indifferent to India would be to describe or understand India completely. There are perhaps very few nations in the world with the enormous variety that India has to offer. Modern day India represents the largest democracy in the world with a seamless picture of unity in diversity unparalleled anywhere else." ya this is quite right that is great country. about tajmahal nothing can be said because it tells it value as its own. i thanks to all who have commented on india who knows the india's strength. thats very nice to see these types of comments about great INDIA. TAJ HE DUNIYA KA SAN ..
JISH KO KOI NAHI BANA SAKTA HE . WO TO HE PAYAR HI SAN.